.Vervaco-Hello Kitty In The Park On Aida Counted Cross Stitch Kit. Vervaco creates magnificent designs in classical and modern styles ideal for both beginners and experts alike! Many designs originate from renowned contemporary artists. This pack contains 14 count 100% cotton Aida fabric, 100% cotton DMC embroidery floss, one needle, and instructions. .Features. Hello Kitty In The Park On Aida Counted Cross Stitch Kit. Imported.14 Count. Specifications. Size:. 12.8 x 7.6 in. .Dimension:. 0.26" H x 13" W x 9" L.Weight:. 0.19 lbs. Vervaco-Hello Kitty In The Park On Aida Counted Cross Stitch Kit. Vervaco creates magnificent designs in classical and modern styles ideal for both beginners and experts alike! Many designs originate from renowned contemporary artists. This pack contains 14 count 100% cotton Aida fabric 100% cotton DMC embroidery floss one needle and instructions. Size: 12.8 x 7.6 in. .Features. Vervaco-wedding record on aida counted cross stitch kit. Vervaco creates magnificent designs in classical and modern styles ideal for both beginners and experts alike Many designs originate from renowned contemporary artists. Specifications. Material:. 100 % Cotton. Size:. 8.75" x 11.5".Dimension:. 8.8 x 11.3 x 0.5". 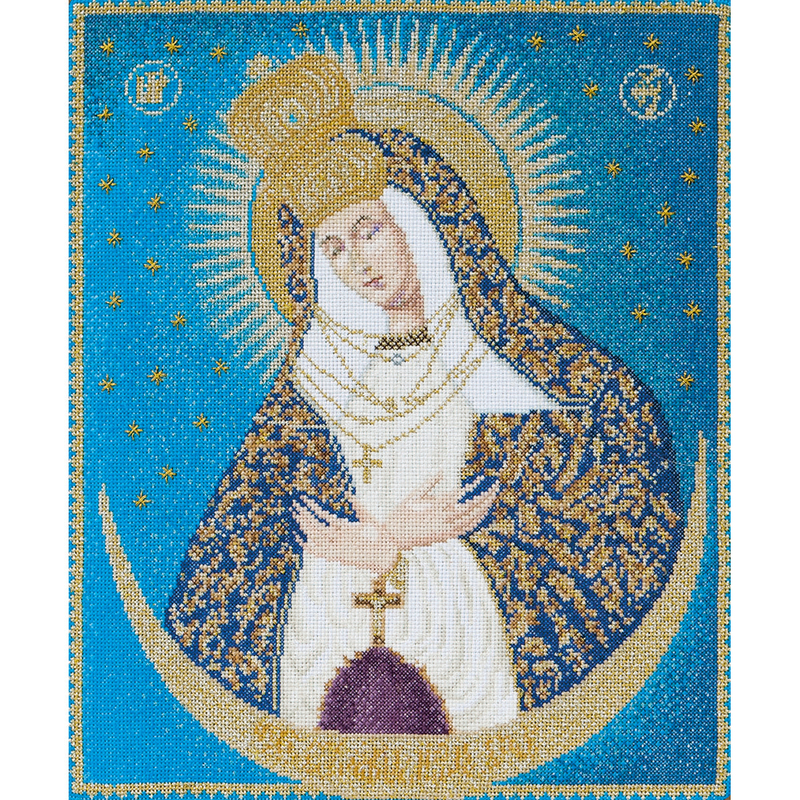 THEA GOUVERNEUR-Our Lady Of The Gate On Aida Counted Cross Stitch Kit: Eighteen Count. Inspired by nature, these kits are detailed using a variety of colors with results that are realistic and true to nature! The more experienced cross stitcher will enjoy working on linen. This package contains one 9-13/16x11-13/16 inch piece of linen Aida, pre-sorted DMC floss, one John James needle, one easy-to-follow chart and instructions in English. Imported. Thea Gouverneur-Aida Counted Cross Stitch Kit: 18 Count. Inspired by nature, these kits are detailed using a variety of colors with results that are realistic and true to nature! This package contains one 9-3/4x11-1/2 inch piece of Aida cloth, pre-sorted DMC floss, one John James needle, one easy-to-follow chart and instructions in English. 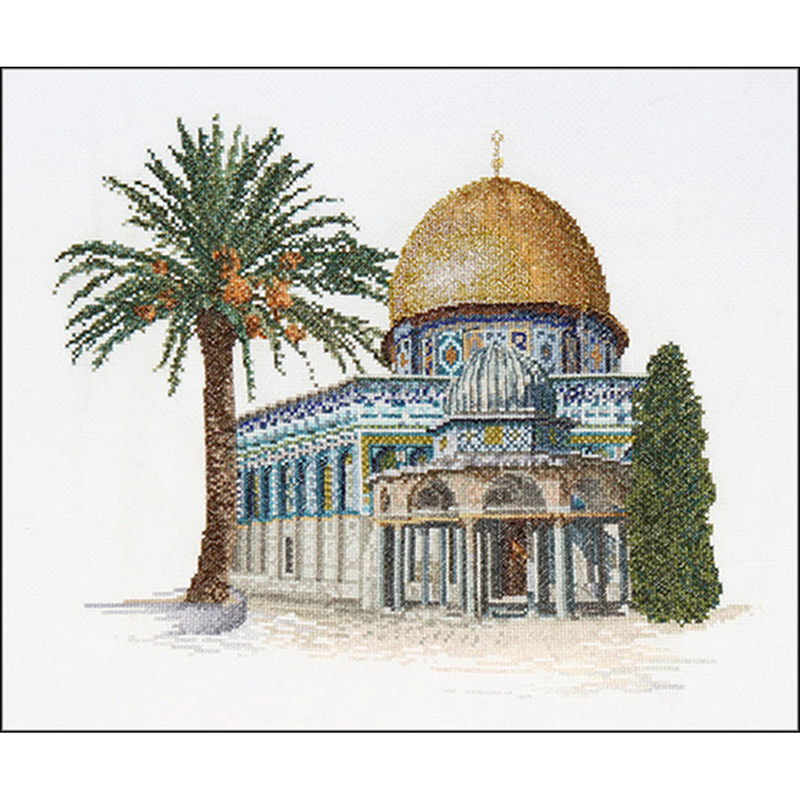 Design: Dome Of The Rock. Imported. THEA GOUVERNEUR-St. George & The Dragon On Aida Counted Cross Stitch Kit: Eighteen Count. Inspired by nature; these kits are detailed using a variety of colors with results that are realistic and true to nature! The more experienced cross stitcher will enjoy working on linen. This package contains one 9-7/64x12-39/64 inch piece of linen Aida; pre-sorted DMC floss; one John James needle; one easy-to-follow chart and instructions in English. Imported. THEA GOUVERNEUR-Our Lady Of The Gate On Aida Counted Cross Stitch Kit: Eighteen Count. Inspired by nature; these kits are detailed using a variety of colors with results that are realistic and true to nature! The more experienced cross stitcher will enjoy working on linen. This package contains one 9-13/16x11-13/16 inch piece of linen Aida; pre-sorted DMC floss; one John James needle; one easy-to-follow chart and instructions in English. Imported. .Vervaco-Growth Chart Aida Counted Cross Stitch Kit. Vervaco creates magnificent designs in classical and modern styles ideal for both beginners and experts alike. Many designs originate from renowned contemporary artists. This package contains 14 count 100% cotton Aida fabric, 100% cotton DMC embroidery floss, one needle, a large full color finished model picture and instructions. Finished size 28x7-1/4 inches. Design Hello Kitty Rainy Days. .Features. Hello Kitty Rainy Days Growth Chart on Aida Counted Cross Stitch Kit, Pack of 14.Imported. Specifications. Dimensions:. 0.47" H x 10.24" W x 8.9" L.Weight:. 0.27 lbs. Vervaco-Tablecloth Stamped Embroidery Kit. Vervaco is internationally renowned as a leading manufacturer of high quality needlework kits. The printed on design disappears after washing. This package contains one pre-finished printed tablecloth with a hemmed inwoven border 100% cotton DMC floss one needle and instructions. Finished size 32x32 inches. Design Coffee Break. Machine washable. Vervaco-On Aida Counted Cross Stitch Kit. Vervaco creates magnificent designs in classical and modern styles ideal for both beginners and experts alike. Many designs originate from renowned contemporary artists. This package contains 18 count 100% cotton Aida fabric 100% cotton DMC embroidery floss three envelopes one needle a large full color finished model picture and instructions. Finished size three 6x4-1/4 inch cards. Design Modern Flowers Greeting Cards. Vervaco-Hand In Hand On Aida Counted Cross Stitch Kit. Vervaco creates magnificent designs in classical and modern styles ideal for both beginners and experts alike! Many designs originate from renowned contemporary artists. This pack contains 18 count 100% cotton Aida fabric 100% cotton DMC embroidery floss one needle and instructions. Size: 6.8 x 10 in. Vervaco-Cheerful Santas On Aida Counted Cross Stitch Kit. Vervaco creates magnificent designs in classical and modern styles ideal for both beginners and experts alike! Many designs originate fro m renowned contemporary artists. This pack contains 14 count 100% cotton Aida fabric 100% cotton DMC embroidery floss one needle and instructions. Size: 11.6 x 6.8 in. Whether you are a professional artist or just like playing around with arts and crafts we have best of Arts&Crafts supplies available at attractive prices. We are committed to bringing newest and trendy products to make it easy and more pleasurable for you. .Vervaco-Table Runner On Aida Counted Cross Stitch Kit. Vervaco is internationally renowned as a leading manufacturer of high quality needlework kits. The printed on design disappears after washing. This package contains one 11 count pre-finished printed Table runner, 100% cotton DMC floss, one needle and instructions. Finished size 33-1/2x12-3/4 inches. Design Squirrel In Autumn. Machine washable. .Features. Squirrel in Autumn Table Runner on Aida Counted Cross Stitch Kit, 11 Per Count. Imported. Specifications. Dimensions:. 0.79" H x 10.39" W x 8.43" L.Weight:. 0.25 lbs. .We provide toys and games to create a new dream world. We are designing, developing and manufacturing high quality, innovative toys and games around the world. We are leading game innovators recognized for our creative products, high caliber and commitment to those with whom we do business. We offer the highest quality products that bring people together to learn and create..Features.14 Count. Three Little Kittens on Aida Counted Cross Stitch Kit. Embroidery needle. Craft type: Cross stitch, Embroidery, Needlepoint, Sewing, Weaving & tapestry. Specifications. Size:. 9 x 8 in..Weight:. 3.2 lbs. .Vervaco-Bookmarks On Aida Counted Cross Stitch Kit. Vervaco creates magnificent designs in classical and modern styles ideal for both beginners and experts alike! Many designs originate from renowned contemporary artists. This pack contains 14 count Zweigart 100% cotton Aida fabric, 100% cotton DMC embroidery floss, one needle, a large full-color finished model picture and instructions. .Features. Clever Owls Bookmarks On Aida Counted Cross Stitch Kit. Imported. Set of 2.14 Count. Specifications. Design:. Clever Owls. Size:. 2.5 x 8 in. .Dimension:. 0.33" H x 6.5" W x 4.7" L.Weight:. 0.08 lbs. .Vervaco-On Aida Counted Cross Stitch Kit. Vervaco creates magnificent designs in classical and modern styles ideal for both beginners and experts alike. Many designs originate from renowned contemporary artists. This package contains 18 count 100% cotton Aida fabric, 100% cotton DMC embroidery floss, three envelopes, one needle, a large full color finished model picture and instructions. Finished size three 6x4-1/4 inch cards. Design Modern Flowers Greeting Cards. .Features.4.2 x 6 in. Modern Flowers Greeting Cards on Aida Counted Cross Stitch Kit, Set of 3 - 18 Per Count. Imported. Specifications. Dimensions:. 0.47" H x 8.5" W x 6.14" L.Weight:. 0.19 lbs. .We provide toys and games to create a new dream world. We are designing, developing and manufacturing high quality, innovative toys and games around the world. We are leading game innovators recognized for our creative products, high caliber and commitment to those with whom we do business. We offer the highest quality products that bring people together to learn and create..Features. Deco butterflies minitures on aida counted cross stitch kit.18 Count. Specifications. Size:. 3 x 4.5 in. .Weight:. 0.11 lbs. .We provide toys and games to create a new dream world. We are designing, developing and manufacturing high quality, innovative toys and games around the world. We are leading game innovators recognized for our creative products, high caliber and commitment to those with whom we do business. We offer the highest quality products that bring people together to learn and create..Features.14 Count. Little Owls Tree on Aida Counted Cross Stitch Kit. Embroidery needle. Craft type: Cross stitch, Embroidery, Needlepoint, Sewing, Weaving & tapestry. Specifications. Size:. 9 x 11.75 in..Weight:. 4.32 lbs. Vervaco V0156111 Apple On Aida Counted Cross Stitch Kit - 7 x 7 in. Finished Size - 7 x 7 in. Dimensions - 8.5 L x 13.1 W x 0.19 H in. Vervaco-Bookmarks On Aida Counted Cross Stitch Kit. Vervaco creates magnificent designs in classical and modern styles ideal for both beginners and experts alike. Many designs originate from renowned contemporary artists. This package contains 14 count cotton Aida fabric 100% cotton DMC embroidery floss one needle a large full- color finished model picture and instructions. Finished size two 8x2-1/2 inch bookmarks. Design Birds In Winter.